For the last few months, state-run companies like IREDA (Indian Renewable Energy Development Agency), NHAI (National Highways Authority of India), NTPC (National Thermal Power Corp), PFC (Power Finance Corporation), HUDCO, REC (Rural Electrification Corp) and IRFC (Indian Railways Finance Corp) have come up with Tax Free Bond issues. All these issues have been oversubscribed. NABARD Tax Free Bonds is the latest issue which is going to be open for subscription from 9th March, 2016 to 14th March 2016. National Bank for Agriculture and Rural Development (NABARD) is an apex development institution in India, having its headquarters in Mumbai (Maharashtra). It was established on July 12, 1982 by a special Act of Parliament and its main focus has since been the upliftment and development of rural India by increasing the credit flow for elevation of agriculture and rural non-farm sector. NABARD has a mandate under the NABARD Act to facilitate credit and other facilities for the promotion and development of agriculture, small scale industries, cottage and village industries, handicrafts and other rural crafts and other allied economic activities in rural areas in India with a view to promoting integrated rural development. The share capital of NABARD as on March 31, 2015, stood at Rs.5,000 crores with GoI holding Rs.4,980 crores (99.60%) and RBI Rs.20.00 crores (0.40%). Bonds Issue opens on : 9th March, 2016. Issue closes on : 14th March, 2016. Issue size including over-subscription: Rs 3,500 crore (max). Basis of Allotment : For Retail Individual Investor – 60% of the Issue Size. NABARD Tax-Free Bonds will be issued either in Physical or Demat mode. On 10 year duration bonds the Coupon rate is 7.29%. On 15 year duration bonds the Coupon rate offered is 7.64%. 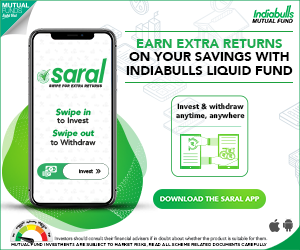 Click on the image to download the application form. Should you subscribe to NABARD Tax Free Bonds 2016 Public Issue? Invest in this issue only if your income tax slab rate is at 30% and you want a steady source of income periodically over a long-term. Also, consider investing only a small portion of your savings towards these bonds..
Kindly share your views and comments on NABARD Tax Free Bonds March 2016 issue. I would like to know what would be a better investment opportunity (tax benefits inclusive) for me since I fall in 20% bracket other than 5 year FD, PPF, VPF. My first priority is safe investment with decent returns+tax benefits. If I have surplus cash what are the other options. I would prefer more debt and less equity exposure. Dear Ashish ..Kindly read : List of best investment options! 1) If one applies for Rs. 10 lakh in Tax free bond on Initial Public offer, is it possible to get allotted the entire sum. 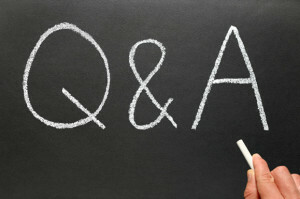 2 – Kindly check out this link, click here..
3 – As of now, NO. The companies may allot the bonds and get them listed within 2 weeks. A question on Category IV retail investor – investors applying for an amount aggregating up to and including 10 lakhs across all series of bonds in tranche I issue. Does this mean you can invest up to 10 lakhs across NHAI, Hudco, Nabard, IRFC etc. Or 10 lakhs in each of these issues from respective companies? If you’re total investment in tax free bonds crosses 10 lakhs and then you would become Category III investor? Dear RB..Rs 10 Lakh in each of the issue, then this investor falls under ‘retail category’, its per issue criteria. Interest component is yearly compounded or its simple interest in case of these bonds? Dear Mangesh..Interest is paid periodically and it is simple rate of interest. 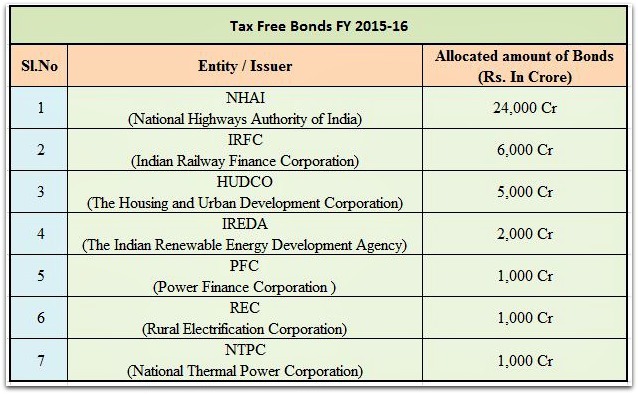 For this year….now only NABARD and IRFC is pending as far as TAX FREE bonds are concern. I wanted to know have the govt sanctioned any for year 2016-2017 starting April…..As far as I was following the budget the govt has sanction amount of 31300 CR but that are NOT tax free bonds. Can you tell me has govt sanctioned any TAX FREE bonds for next year??? Yes, Rs 31,300 cr has been allocated for issuing bonds in FY 2016-17, but looks like that these are not Tax-free bonds and may be only Infrastructure bonds.